Dual boiler coffee machines. Why? Should you spend your money on a coffee machine with two boilers? Getting the temperature spot-on. Great tasting coffee is best brewed between 93°C to 96°C. The milk – textured (i.e. 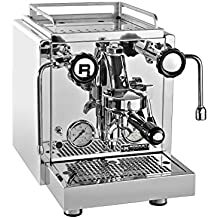 the frothy stuff on cappuccino or latte) or flat – is best served at around 60°C, but in fact to achieve textured milk, a machine with a steam-wand is ideal (up to 130°C). Yes I know, you can buy stand-alone milk heaters and frothers, but top-notch milk-texturing is skillfully achieved by using the steam wand to introduce the right amount of air bubbles. Convenience. You will see that in artisan or expert coffee shops, they are able to pull espresso, texture milk, and serve hot water at the same time. This seems to be a time-saver for a busy coffee shop, but in fact it would be difficult to operate such a shop otherwise. Consistency. Consistency is such a vital word in the world of coffee, I am surprised we don’t see hear more about it. Consistency of bean freshness, water quality, dosage, tamping pressure, and brewing temperature are really important when making good coffee – consistently. The home barista can control all of those except for the behaviour of the boiler, and is the one “external factor” that the home barista usually needs his or her machine to take care of. 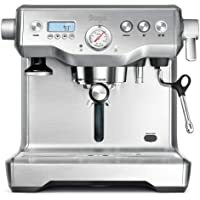 Many consumer coffee machines have a single boiler (you often see them called “thermoblock”) which keeps the water at the ideal coffee-brewing temperature. But some machines offer a “steam mode” – this basically raises the temperature of the thermoblock to a higher temperature to make steam. That is all well and good, but this introduces an additional heat-up action between making the coffee and then being able to texture the milk. Why is that not desirable? To prepare more than one drink, the time delays between pulling espresso, adding textured milk, pulling the next espresso, etc, can be a pain. If you are making a single cappuccino or latte, then the delay between the end of the coffee pull and ability to add the textured milk is probably OK for the home barista. The two main issues are cost because a machine with two boilers is inherently more expensive and has higher running costs, and dimensions as a machine with two boilers takes up more kitchen space that a similar machine with one. Should I buy one? Is it a good gift? If you are looking to totally delight your coffee-drinking or gadget-loving partner at Christmas, then one of these machine will do just that! For the regular milked coffee drinker it’ll be worth it if you can afford the extra cost and have the space. 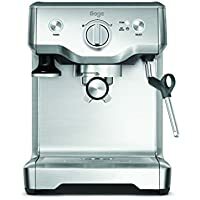 For the dedicated coffee nut or enthusiastic home barista – it would be a great purchase – again if you can afford the higher purchase price. A final thought, these machines are more expensive but tent to be top-notch brands, so you know you are buying a quality machine. We haven’t tested any dual boiler machines ourselves (although we have asked one of these manufacturers…). Anyway, Sage seem to lead the way for consumer-level machines. However, there is also a terrific looking Rocket machine. In any event, its your buying decision so we encourage you to make that decision with the proper research. Well, there may be. But there is a cost related to the extra boiler. And where many manufacturers explain methods to help you more-rapidly cool a single boiler, you run in to the same issues of how quickly can you churn out a few coffees and the lower convenience. However, we did note that this “Duo Temp” machine uses a cold water purge system to help get that temperature down – so this makes for a more affordable alternative. Some of the links on this page may be affiliate links. When you buy through those links we may receive a commission for the sale. This has no effect on the price for you. For example, as an Amazon Associate we earn from qualifying purchases. We encourage you to review and carefully consider what you are buying. We try to help by giving tips and information, but buying decisions are yours. Some of the product links are affiliate links. When you buy through those links we may receive a commission for the sale. This has no effect on the price for you. For example, as an Amazon Associate we earn from qualifying purchases.